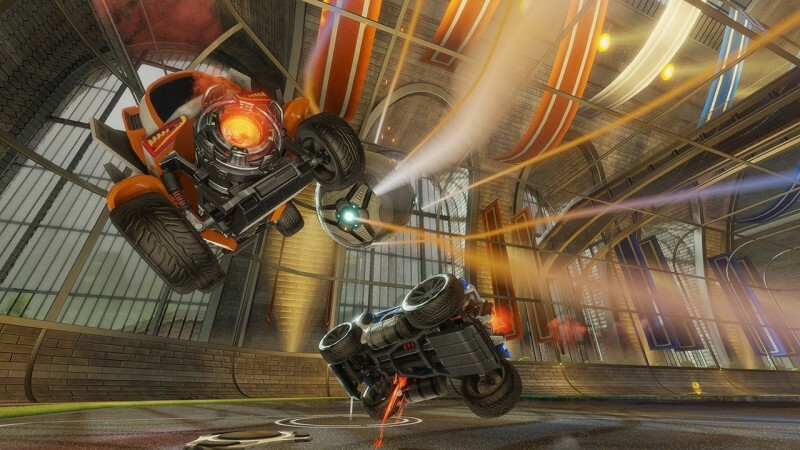 Play a few Rocket League matches and you see more than a few similarities between the game’s RC-car action and pre-K level soccer. A mass of players follows the ball wherever it rolls, teammates steal from each other, and accidental own-goal shots are almost expected. 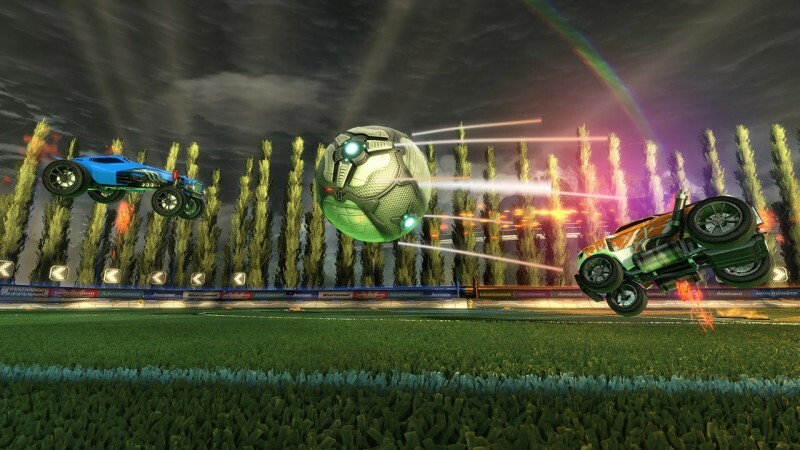 Even after your skill level advances and you’re able to make exhilarating mid-air saves and coordinated attacks, your car (and team) looks adorable in post-goal replays. 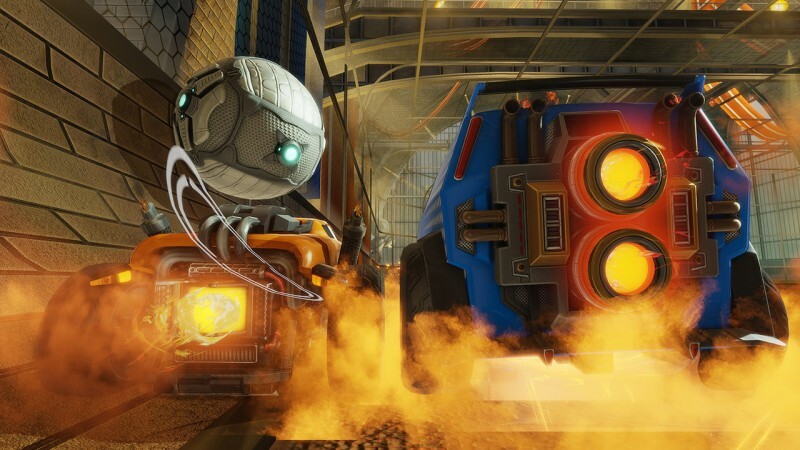 Its game face may be set in a goofy grin instead of an intimidating snarl, but Rocket League’s beautifully balanced gameplay is one of the best competitive games I’ve played in ages. 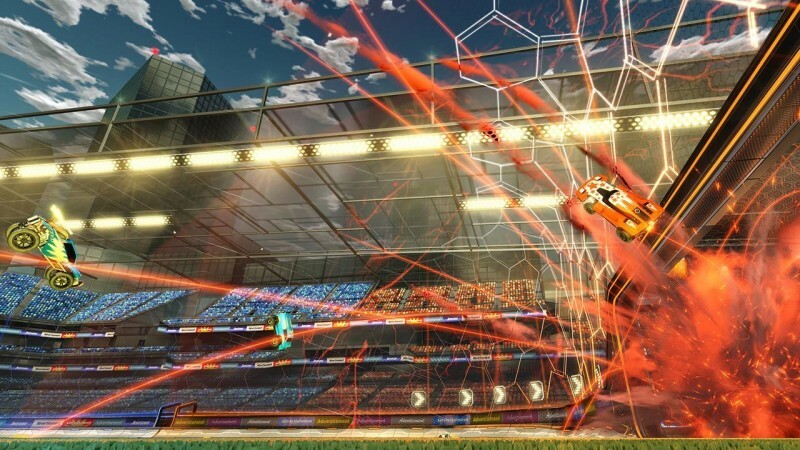 Psyonix’s game is deceptive on nearly every level. I’ve played car soccer plenty of times over the years, usually in the form of an ill-conceived minigame. These are usually frustrating, since pushing a ball around with a car is an unsurprisingly clunky task. 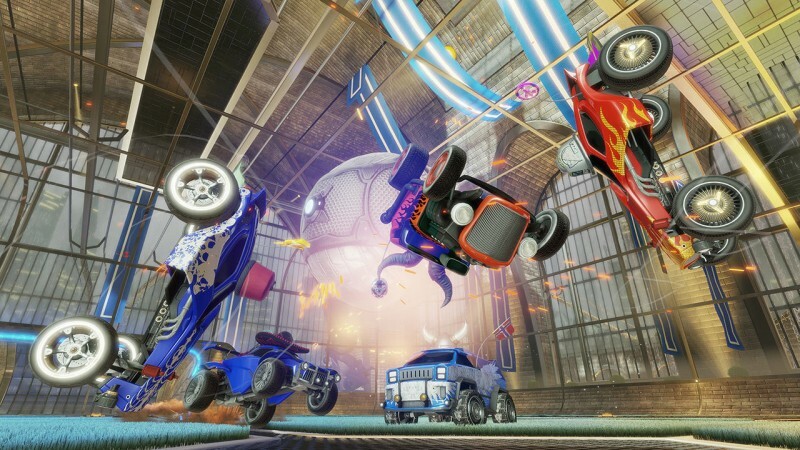 Rocket League is also clunky at first, but the nimble cars make vehicular soccer a breeze once you get over the initial speed bumps. The basics are similar to most third-person arcade racers out there, but you need to spend time learning how to use your car’s advanced spins, boosts, and rocket thrusts to get the most of the game. Spend some time in the tutorials – it’s worth it. When you’ve finally gotten the hang of driving, Rocket League is an absolute joy. The rules are the same whether you’re playing 1v1, 2v2, 3v3, or 4v4 matches: earn the most points in five minutes. You nudge, slam, bonk, or bash the ball into your opponents’ goal. The arena walls are banked into high walls, so the ball is in play no matter how exuberantly it’s been hit, which keeps the action moving. The arenas are sized nicely, too. They’re small enough to where you can assist on defense if you see an opponent tearing toward your goal, but they’re large enough so players aren’t unnecessarily trading paint just driving into position. Matches are short and players are given a steady drip of cosmetic upgrades for their vehicles by simply participating. 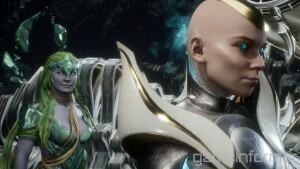 None of them affect gameplay, but a variety of hats, paint effects, body types, and smoke-trail designs let players show off their personality during the slow-motion replays. The in-game action goes by too quickly to appreciate the visual details, from the textures on the arena floors to the flecks of glitter in the paint. It’s more beautiful than it needs to be, really. There is a single-player option in the form of a season mode, though playing against A.I. isn’t nearly as satisfying as knowing that you’re getting one past (or helping out) another player. The focus here is multiplayer, and if you can’t get online or wrangle up some fellow players for local matches, you’re missing out on the best experience the game offers. 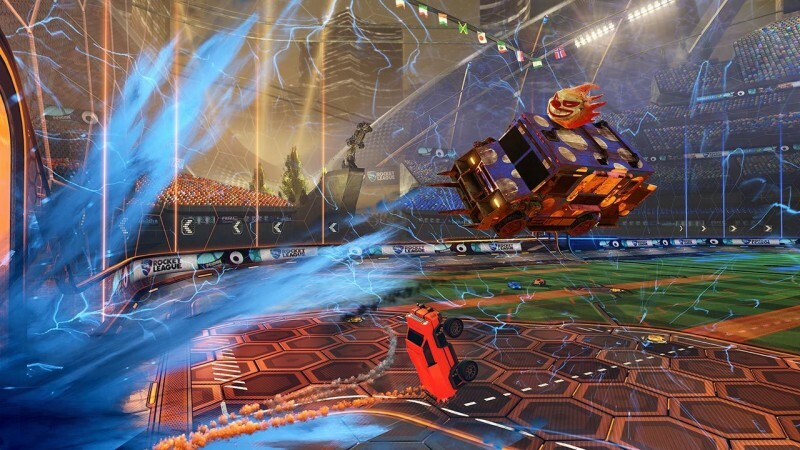 Once I fully connected with Rocket League’s controls, my car felt like an extension of me. It’s a sensation that’s all too rare in games, which makes it all the more satisfying when something like it comes along. 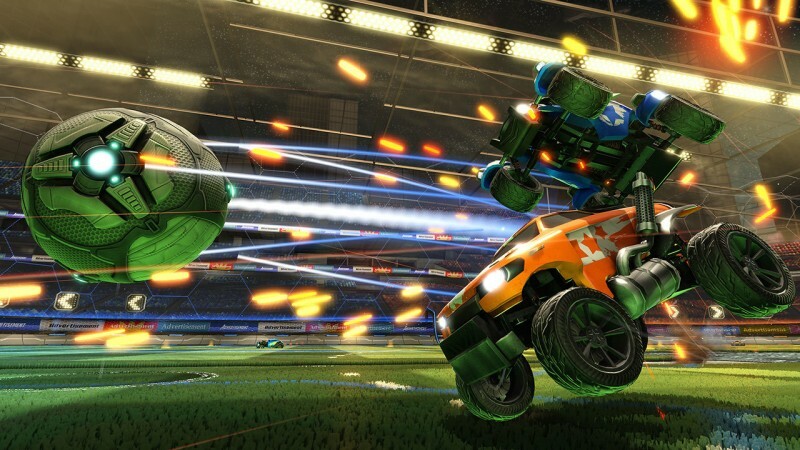 Psyonix's fast and frenzied car-soccer game is an absolute joy to play.